At the finish receiving our prizes for 1st, 2nd, and 3rd overall. These young bucks are fast! It is now Wednesday the 25th of April. 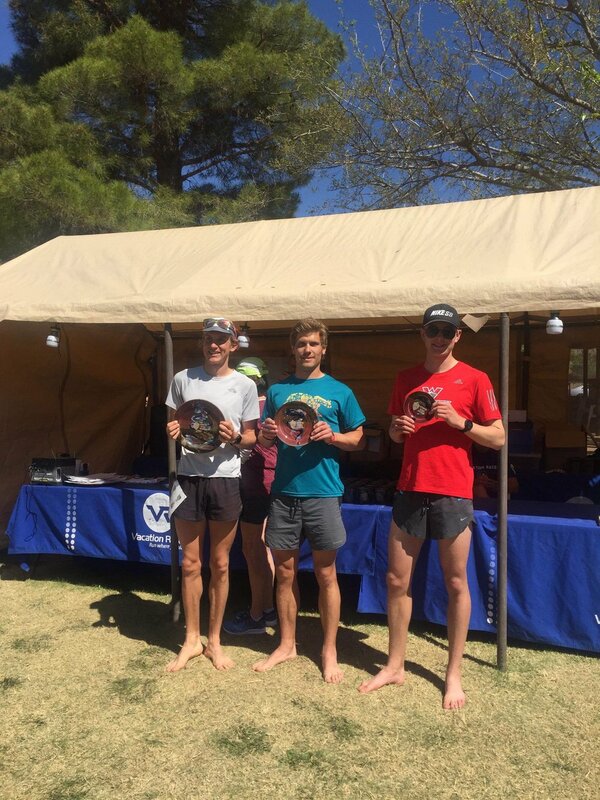 I sit here in my running shorts coming back from a mellow run in the nice spring weather, still feeling a little leg fatigue from the breathtaking Zion 50K that took place on the 21st. This course is a relatively flat race for a trail race in Utah. Throughout the 31 miles you go up 3,200 feet and down 3,200 feet. The race started at 6am in the dark. The temperature was a bit nippy at ~40 degrees Fahrenheit. Throughout the day there was a 35 degree increase! That gives you an idea of how the desert temperatures vary in Utah. Overall I am quite happy with how the race finished. I unfortunately hit a "wall" around mile 20 which set me back a bit from 1st place but I was able to hold 2nd place for the remaining 10 miles. I have never been a very fast flat ground runner, but in this race I proved to myself that I can keep up a pretty good pace (~7:48 min/mile) for a pretty long time, and I feel happy about that. The race started out with 3 of us in front. Not after 3 miles there were just two of us, Levi Hawks and myself. The race started out with some nice double track dirt roads. After about 4 miles we approached the first, and really the only major climb of 1,000 feet in one mile. At that point I was able to pass Levi. Approaching the first aid station I was in and out, wanting to keep the little lead that I had. On top of a beautiful mesa, I took in the orange sunrise as I weaved through the Gooseberry biking trail. This section of the course is very runnable but there is a lot of short ups and downs and abrupt turns. The course is easy to get lost on, I got off the course just a bit at least 3 times. Luckily I didn't loose too much time getting off trail. After a quick pee break I heard 2nd coming up quickly. After going through the 2nd aid station, the gap I had reduced to about 100 feet. It took one last deviation off the trail before Levi and I were running with each other again. After a quick stop at an aid station, we headed back down what we climbed up earlier that morning. The decent was a nice break as I began engaging my quads and giving my hamstrings and hip flexors a break. After descending, we were back onto some nice, flat double track trails. Casually conversing with Levi, I began to feel a serious drop in energy. If you've ever done a long distance race, you're probably very familiar with this sensation. I knew I was running through my glycogen stores quickly and I consumed two gels one after the other to increase calories and glucose into my system. Slowly I lost sight of Levi and I had to listen to my body. I kept a consistent pace, but it was quite a bit slower than the pace I had sustained throughout the race. I was in a tough position, I could have had another gel, but I could have risked putting my stomach in jeopardy as the stomach can only handle so much sugar and calories at one time. I chose to not risk stomach problems and pushed through with a caloric deficit. Once I hit the last aid station, I was feeling a bit better, but my pace was still not too great. Soon after, with about 3 miles to go to the finish, I saw 3rd place approaching at a faster pace than what I was sustaining. I didn't have much choice if I wanted hold onto my position but to amp up the speed. The last 3 miles were a real push for me but I kept my distance between myself and 3rd place. I finished only 40 seconds before 3rd place in 4:02. Not too long after, my older brother Eric crossed the line in 7th place! Not bad for taking a 2.5 year hiatus and not training much at all. 1. Do more long runs to prepare your body for race day. I have said this to myself year after year, but I still hate long runs and don't do them as much as I should. Coaches and professional runners seem to agree that this is the most important workout for improving race day performance. I only had one good long run of 20 miles before the race. The rest were 15-18 miles. Looking back, more 20+ mile long runs would have done my body and mind good. It was apparent that once I hit 20 miles during the race, my body wasn't prepared for the remaining 10 miles. It's hard to know if this was a nutritional issue or simply a lack of training. I felt like I was running quite conservative with a moderate pace for me. It was frustrating to run out of energy when I felt like I wasn't going too hard at any point in the race. 2. Eat more gels and food throughout the day. I never have been good about getting the calories I need every hour (~250 calories) during a race. This adds up and if you're not on top of your eating game while running, you will feel it later. I will say though, I had more gels in this 50 kilometer race than any other race of the same distance. I have found a gel that I actually like. Unfortunately I only had a few of these gels (Spring Energy) and wasn't too happy about consuming other super sweet gels. Note to self...bring more Spring energy gels next time. 3. Up the miles. I already covered increasing my long runs, but increasing my weekly mileage wouldn't hurt either. The most I have ever hit in a training week is 70 miles. My body feels tired when I do this, but not exhausted. I will start working up my weekly mileage at a slower pace as to help my body slowly adapt. 4. Increase moderate speed work. My training seemed to be either fast or slow. I was doing a lot of easy runs, and a few really fast track workouts. I should have thrown in some more tempo runs at a moderate pace that I can sustain for maybe an hour. 5. Stay in the race mentally. Comfortably in 2nd I decided I would let off a bit to let my body recuperate. Well, the truth is I already gave myself the time to recuperate but continued to tell myself I needed to go slower. Obviously I had more in me when 3rd was approaching. I need to push myself to the end by imaging there is someone constantly on my tail. Tres hermanos. Eric in the middle and I ran the race while Coulson was crewing. Our mom and dad came out to support too!